For other people named Henry Irving, see Henry Irving (disambiguation). Sir Henry Irving (6 February 1838 – 13 October 1905), born John Henry Brodribb, sometimes known as J. H. Irving, was an English stage actor in the Victorian era, known as an actor-manager because he took complete responsibility (supervision of sets, lighting, direction, casting, as well as playing the leading roles) for season after season at the Lyceum Theatre, establishing himself and his company as representative of English classical theatre. In 1895 he became the first actor to be awarded a knighthood, indicating full acceptance into the higher circles of British society. Irving is widely acknowledged to be one of the inspirations for Count Dracula, the title character of the 1897 novel Dracula whose author, Bram Stoker, was business manager of the theatre. Irving was born to a working-class family in Keinton Mandeville in the county of Somerset. W.H. Davies, the celebrated poet, was a cousin. Irving spent his childhood living with his aunt, Mrs Penberthy, at Halsetown in Cornwall. He competed in a recitation contest at a local Methodist chapel where he was bested by William Curnow, later the editor of The Sydney Morning Herald. He attended City Commercial School for two years before going to work in the office of a law firm at age 13. When he saw Samuel Phelps play Hamlet soon after this, he sought lessons, letters of introduction, and work in a theatre in Sunderland in 1856, labouring against great odds until his 1871 success in The Bells in London set him apart from all the rest. He married Florence O'Callaghan on 15 July 1869 at St. Marylebone, London, but his personal life took second place to his professional life. On opening night of The Bells, 25 November 1871, Florence, who was pregnant with their second child, criticised his profession: "Are you going on making a fool of yourself like this all your life?" Irving exited their carriage at Hyde Park Corner, walked off into the night, and chose never to see her again. He maintained a discreet distance from his children as well, but became closer to them as they grew older. Florence Irving never divorced Irving, and once he had been knighted she styled herself "Lady Irving"; Irving never remarried. His elder son, Harry Brodribb Irving (1870–1919), usually known as "H B Irving", became a famous actor and later a theatre manager. His younger son, Laurence Irving (1871–1914), became a dramatist and later drowned, with his wife, in the sinking of the Empress of Ireland. H B married Dorothea Baird and they had a son, Laurence Irving (1897–1988), who became a well-known Hollywood art director and his grandfather's biographer. In November 1882 Irving became a Freemason, being initiated into the prestigious Jerusalem Lodge No 197 in London. In 1887 he became a founder member and first Treasurer of the Savage Club Lodge No 2190, a Lodge associated with London's Savage Club. He eventually took over the management of the Lyceum Theatre and brought actress Ellen Terry into partnership with him as Ophelia to his Hamlet, Lady Macbeth to his Macbeth, Portia to his Shylock, Beatrice to his Benedick, etc. Before joining the Lyceum, Terry had fled her first marriage and conceived two out-of-wedlock children with bohemian artist Godwin, but regardless of how much and how often her behavior defied the strict morality expected by her Victorian audiences, she somehow remained popular. It could be said that Irving found his family in his professional company, which included his ardent supporter and manager Bram Stoker and Terry's two illegitimate children, Teddy and Edy. Years later, when Irving was dead, Marguerite Steen asked Ellen whether she really had been Irving's lover, and she promptly answered: 'Of course I was. We were terribly in love for a while.' But at earlier periods in her life, when there were more people around to be offended, she said contradictory things. Terry's son Teddy, later known as Edward Gordon Craig, spent much of his childhood (from 1879, when he was 8, until 1897) indulged by Irving backstage at the Lyceum. Craig, who came to be regarded as something of a visionary for the theatre of the future, wrote an especially vivid, book-length tribute to Irving. ("Let me state at once, in clearest unmistakable terms, that I have never known of, or seen, or heard, a greater actor than was Irving.") George Bernard Shaw, at the time a theatre critic who was jealous of Irving's connection to Ellen Terry (whom Shaw himself wanted in his own plays), conceded Irving's genius after Irving died. Caricature (by Ape) of Irving in The Bells. Vanity Fair, 19 December 1874. After a few years' schooling while living at Halsetown, near St Ives, Cornwall, Irving became a clerk to a firm of East India merchants in London, but he soon gave up a commercial career for acting. On 29 September 1856 he made his first appearance at Sunderland as Gaston, Duke of Orleans, in Bulwer Lytton's play, Richelieu, billed as Henry Irving. This name he eventually assumed by royal licence. When the inexperienced Irving got stage fright and was hissed off the stage the actor Samuel Johnson was among those who supported him with practical advice. Later in life Irving gave them all regular work when he formed his own Company at the Lyceum Theatre. For 10 years, he went through an arduous training in various stock companies in Scotland and the north of England, taking more than 500 parts. his delineations of the various characters (...) were admirably graphic, and met with repeated rounds of applause. Possesed of a fine voice, which he modulated with great taste and judgment, he was able to mark the depth or frivolity of the character he was representing with remarkable facility. He gained recognition by degrees, and in 1866 Ruth Herbert engaged him as her leading man and sometime stage director at the St. James's Theatre, London, where she first played Doricourt in The Belle's Stratagem. One piece that he directed there was W. S. Gilbert's first successful solo play, Dulcamara, or the Little Duck and the Great Quack (1866) The next year he joined the company of the newly opened Queen's Theatre, where he acted with Charles Wyndham, J. L. Toole, Lionel Brough, John Clayton, Mr. and Mrs. Alfred Wigan, Ellen Terry and Nellie Farren. This was followed by short engagements at the Haymarket Theatre, Drury Lane, and the Gaiety Theatre. Finally he made his first conspicuous success as Digby Grant in James Albery's Two Roses, which was produced at the Vaudeville Theatre on 4 June 1870 and ran for a very successful 300 nights. In 1871, Irving began his association with the Lyceum Theatre by an engagement under Bateman's management. The fortunes of the house were at a low ebb when the tide was turned by Irving's sudden success as Mathias in The Bells, a version of Erckmann-Chatrian's Le Juif polonais by Leopold Lewis, a property which Irving had found for himself. The play ran for 150 nights, established Irving at the forefront of the British drama, and would prove a popular vehicle for Irving for the rest of his professional life. With Bateman, Irving was seen in W. G. Wills' Charles I and Eugene Aram, in Richelieu, and in 1874 in Hamlet. The unconventionality of this last performance, during a run of 200 nights, aroused keen discussion and singled him out as the most interesting English actor of his day. In 1875, again with Bateman, he was seen as the title character in Macbeth; in 1876 as Othello, and as Philip in Alfred Lord Tennyson's Queen Mary; in 1877 in Richard III; and in The Lyons Mail. 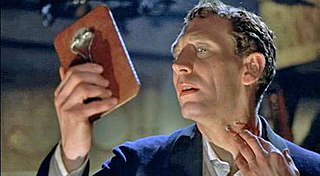 During this time he became lifelong friends with Bram Stoker, who praised him in his review of Hamlet and thereafter joined Irving as the manager for the company. In 1878, Irving entered into a partnership with actress Ellen Terry and re-opened the Lyceum under his own management. With Terry as Ophelia and Portia, he revived Hamlet and produced The Merchant of Venice (1879). His Shylock was as much discussed as his Hamlet had been, the dignity with which he invested the vengeful Jewish merchant marking a departure from the traditional interpretation of the role. After the production of Tennyson's The Cup and revivals of Othello (in which Irving played Iago to Edwin Booth's title character) and Romeo and Juliet, there began a period at the Lyceum which had a potent effect on the English stage. Much Ado about Nothing (1882) was followed by Twelfth Night (1884); an adaptation of Goldsmith's Vicar of Wakefield by W. G. Wills (1885); Faust (1886); Macbeth (1888, with incidental music by Arthur Sullivan); The Dead Heart, by Watts Phillips (1889); Ravenswood by Herman, and Merivales' dramatic version of Scott's Bride of Lammermoor (1890). Portrayals in 1892 of the characters of Wolsey in Henry VIII and of the title character in King Lear were followed in 1893 by a performance of Becket in Tennyson's play of the same name. During these years, too, Irving, with the whole Lyceum company, paid several successful visits to the United States and Canada, which were repeated in succeeding years. As Terry aged, there seemed to be fewer opportunities for her in his company; that was one reason she eventually left, moving on into less steady but nonetheless beloved stage work, including solo performances of Shakespeare's women. Scholars have long agreed that keys to the Dracula tale's origin and meaning lie in the manager's relationship with Irving in the 1880s. … There is virtual unanimity on the point that the figure of Dracula—which Stoker began to write notes for in 1890—was inspired by Henry Irving himself. … Stoker's numerous descriptions of Irving correspond so closely to his rendering of the fictional count that contemporaries commented on the resemblance. … But Bram Stoker also internalized the fear and animosity his employer inspired in him, making them the foundations of his gothic fiction. The chief remaining novelties at the Lyceum during Irving's term as sole manager (at the beginning of 1899 the theatre passed into the hands of a limited-liability company) were Arthur Conan Doyle's Waterloo (1894); J. Comyns Carr's King Arthur in 1895; Cymbeline, in which Irving played Iachimo, in 1896; Sardou's Madame Sans-Gene in 1897; and Peter the Great, a play by Laurence Irving, the actor's second son, in 1898. Irving received a death threat in 1899 from fellow actor (and murderer of William Terriss) Richard Prince. Terriss had been stabbed at the stage door of the Adelphi Theatre in December 1897 and in the wake of his death, Prince was committed to Broadmoor Criminal Lunatic Asylum. Irving was critical of the unusually lenient sentence, remarking 'Terriss was an actor, so his murderer will not be executed.' Two years later, Prince had found Irving's home address and threatened to murder him 'when he gets out'. Irving was advised to submit the letter to the Home Office to ensure Prince's continued incarceration, which Irving declined to do. In 1898 Irving was Rede Lecturer at the University of Cambridge. The new regime at the Lyceum was signalled by the production of Sardou's Robespierre in 1899, in which Irving reappeared after a serious illness, and in 1901 by an elaborate revival of Coriolanus. Irving's only subsequent production in London was as Sardou's Dante (1903) at the Drury Lane. Within three months, on October 13, 1905, Henry Irving, when appearing as Becket at the Bradford Theatre, was seized with syncope just after uttering Becket's dying words 'Into thy hands, O Lord, into thy hands', and though he lived for an hour or so longer he never spoke again. The chair that he was sitting in when he died is now at the Garrick Club. He was cremated and his ashes buried in Westminster Abbey, thereby becoming the first person ever to be cremated prior to interment at Westminster. There is a statue of him near the National Portrait Gallery in London. That statue, as well as the influence of Irving himself, plays an important part in the Robertson Davies novel World of Wonders. The Irving Memorial Garden was opened on 19 July 1951 by Laurence Olivier. A memorial to Irving in Brixton, London. Both on and off the stage, Irving always maintained a high ideal of his profession, and in 1895 he received a knighthood (first offered in 1883), the first ever accorded an actor. He was also the recipient of honorary degrees from the universities of Dublin (LL.D 1892), Cambridge (Litt.D 1898), and Glasgow (LL.D 1899). He also received the Komthur Cross, 2nd class, of the Saxe-Ernestine House Order of Saxe-Coburg-Gotha and Saxe-Meiningen. His acting divided critics; opinions differed as to the extent to which his mannerisms of voice and deportment interfered with or assisted the expression of his ideas. Mr Burwin-Fossleton as Henry Irving. Chapter XI of The Diary of a Nobody. "...who not only looked rather like Mr Irving but seemed to imagine he was the celebrated actor... he began doing the Irving business all through supper. He sank so low down in his chair that his chin was almost on a level with the table, and twice he kicked Carrie under the table, upset his wine, and flashed a knife uncomfortably near Gowing's face." In the 1963 West End musical comedy Half a Sixpence the actor Chitterlow does an impression of Irving in The Bells. Percy French's burlesque heroic poem "Abdul Abulbul Amir" lists among the mock-heroic attributes of Abdul's adversary, the Russian Count Ivan Skavinsky Skavar, that "he could imitate Irving". In the 1995 film A Midwinter's Tale by Kenneth Branagh, two actors discuss Irving, and one of them, Richard Briers does an imitation of his speech. In the play The Woman in Black, set in the Victorian era, the actor playing Kipps tells Kipps 'We'll make an Irving of you yet,' in Act 1, as Kipps is not a very good actor due to his inexperience. In 1906 Bram Stoker published a two-volume biography about Irving called Personal Reminiscences of Henry Irving. ^ Jeffrey Richards (2007). Sir Henry Irving: A Victorian Actor and His World. A&C Black. p. 109. ^ a b Lee, Sidney, ed. (1912). "Irving, Henry" . Dictionary of National Biography (2nd supplement). 2. London: Smith, Elder & Co. p. 352. ^ John Langdon Bonython, Address of the President, Journal of the Royal Institution of Cornwall, Volume XXIV, Parts 1 and 2, 1933-34, p8-9. ^ Kilgarriff, Michael. "Sir Henry Irving – Biography". The Irving Society. Retrieved 12 February 2017. ^ "Distinguished members" section, Savage Club Lodge website. ^ "Samuel Johnson c.1830-1900 A Life from the Grave, by Jennie Bisset". The Irving Society. November 2013. Archived from the original on 13 December 2013. ^ "Music and the Drama: Irving's Vsit". The Week : a Canadian journal of politics, literature, science and arts. 1 (13): 204. 28 February 1884. Retrieved 27 April 2013. ^ Aberdeen Evening Express British Newspaper Archive 05 April 1899, p.3. ^ "Irving, Sir Henry (IRVN898H)". A Cambridge Alumni Database. University of Cambridge. ^ "Sir Henry Irving Is Dead, Sudden Collapse at the Midland Hotel". Midland Railway Hotel — Bradford. Archived from the original on 20 March 2012. Retrieved 14 July 2011. ^ "Woking Crematorium". Internet. The Cremation Society of Great Britain. Retrieved 28 November 2010. ^ Grossmith, George and Weedon. (1892). The Diary of a Nobody. Arrowsmith, Bristol. Burwin-Fosselton returns on several evenings in full "Irving" costume; Mr Pooter confides to his diary that "... one can have even too much imitation of Irving." ^ Stoker, Bram (1906). Personal Reminiscences of Henry Irving. A complete PDF version of the book can be downloaded from Bram Stoker Online. Retrieved from "Archived copy". Archived from the original on 24 June 2011. Retrieved 8 January 2010. CS1 maint: Archived copy as title (link). Chisholm, Hugh, ed. (1911). "Irving, Sir Henry" . Encyclopædia Britannica (11th ed.). Cambridge University Press. Anonymous (1873). "Henry Irving" . Cartoon portraits and biographical sketches of men of the day. Illustrated by Frederick Waddy. London: Tinsley Brothers. pp. 52–53. Wikimedia Commons has media related to Henry Irving. Abraham "Bram" Stoker was an Irish author, best known today for his 1897 Gothic novel Dracula. 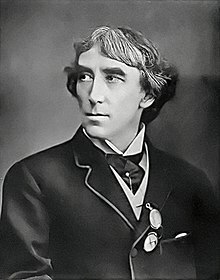 During his lifetime, he was better known as the personal assistant of actor Sir Henry Irving and business manager of the Lyceum Theatre in London, which Irving owned. Dracula is an 1897 Gothic horror novel by Irish author Bram Stoker. It introduced the character of Count Dracula, and established many conventions of subsequent vampire fantasy. The novel tells the story of Dracula's attempt to move from Transylvania to England so that he may find new blood and spread the undead curse, and of the battle between Dracula and a small group of men and a woman led by Professor Abraham Van Helsing. Dame Alice Ellen Terry,, known professionally as Ellen Terry, was an English actress who became the leading Shakespearean actress in Britain. James William Wallack was an Anglo-American actor and manager, born in London, and brother of Henry John Wallack. Henry Kemble was a British actor. A member of the famed Kemble family, he was the grandson of Charles Kemble. William Terriss, born as William Charles James Lewin, was an English actor, known for his swashbuckling hero roles, such as Robin Hood, as well as parts in classic dramas and comedies. He was also a notable Shakespearean performer. He was the father of the Edwardian musical comedy star Ellaline Terriss and the film director Tom Terriss. The Lyceum Theatre is a 2,100-seat West End theatre located in the City of Westminster, on Wellington Street, just off the Strand. The origins of the theatre date to 1765. Managed by Samuel Arnold, from 1794 to 1809 the building hosted a variety of entertainments including a circus produced by Philip Astley, a chapel, and the first London exhibition of waxworks displayed by Madame Tussaud. From 1816 to 1830, it served as The English Opera House. After a fire, the house was rebuilt and reopened on 14 July 1834 to a design by Samuel Beazley. The building was unique in that it has a balcony overhanging the dress circle. It was built by the partnership of Peto & Grissell. The theatre then played opera, adaptations of Charles Dickens novels and James Planché's "fairy extravaganzas", among other works. Jonathan Harker is a fictional character and one of the main protagonists of Bram Stoker's 1897 Gothic horror novel Dracula. His journey to Transylvania and encounter with the vampire Count Dracula and his Brides at Castle Dracula constitutes the dramatic opening scenes in the novel and most of the film adaptations. Stoker appropriated the surname from his friend Joseph Cunningham Harker (1855-1920), a set designer at the Lyceum Theatre and father of actor William Gordon Harker (1885-1967) as well as great-grandfather of actress Polly Adams, whose actress-daughters Susannah Harker and Caroline Harker adopted the Harker surname for their stage names. Florence Balcombe was the wife and literary executor of Bram Stoker. She is remembered for her legal dispute with the makers of Nosferatu, an unauthorised film based on her husband's novel Dracula. Fred Terry was an English actor and theatrical manager. After establishing his reputation in London and in the provinces for a decade, he joined the company of Herbert Beerbohm Tree where he remained for four years, meeting his future wife, Julia Neilson. With Neilson, he played in London and on tour for 27 further years, becoming famous in sword and cape roles, such as the title role in The Scarlet Pimpernel. Harry Brodribb Irving, was a British stage actor and actor-manager; the eldest son of Sir Henry Irving and his wife Florence, and father of designer Laurence Irving and actress Elizabeth Irving. Violet Vanbrugh, born Violet Augusta Mary Barnes, was an English actress who had a career spanning more than 50 years. Despite her many successes, her career was overshadowed by that of her more famous sister Irene Vanbrugh. Dracula is a stage play written by Hamilton Deane in 1924, then revised by John L. Balderston in 1927. It was the first authorized adaptation of Bram Stoker's novel Dracula. After touring in England, the original version of the play appeared at London's Little Theatre in July 1927, where it was seen by the American producer Horace Liveright. Liveright asked Balderston to revise the play for a Broadway production that opened at the Fulton Theatre in October 1927. This production starred Bela Lugosi in his first major English-speaking role. Marion Bessie Terry was an English actress. In a career spanning half a century, she played leading roles in more than 125 plays. Always in the shadow of her older and more famous sister Ellen, Terry nevertheless achieved considerable success in the plays of W. S. Gilbert, Oscar Wilde, Henry James and others. William Lugg was an English actor and singer of the late Victorian and Edwardian eras. He had a long stage career beginning with roles in several Gilbert and Sullivan operas and continuing for over four decades in drama, comedy and musical theatre. Later in his career, he appeared in nine silent films in the early years of British cinema. Ellen Terry as Lady Macbeth is an oil painting by John Singer Sargent. 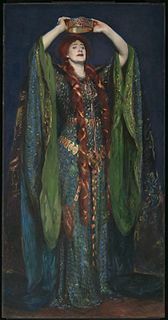 Painted in 1889, it depicts actress Ellen Terry in a famous performance of William Shakespeare's tragedy Macbeth, wearing a green dress decorated with iridescent beetle wings. The play was produced by Henry Irving at the Lyceum Theatre, London, with Irving also playing Macbeth opposite Terry. Sargent attended the opening night on 29 December 1888 and was inspired to paint Terry's portrait almost immediately. James Roland MacLaren was a Scottish actor and playwright. The Terry family was a theatrical dynasty of the late 19th century and beyond. The family includes not only those members with the surname Terry, but also Neilsons, Craigs and Gielguds, to whom the Terrys were linked by marriage or blood ties. Samuel Johnson was an actor-manager and Shakespearean actor of the 19th century and a member of Henry Irving's Company at the Lyceum Theatre, for which he played the comedy roles.